The Jeep Wrangler is one of those vehicles that even non-car people love. It makes you feel cooler no matter who you are, even if you never take it off-road. Especially in Rubicon form, driving a Wrangler around when you don't intend to off-road it makes no sense. It's not built for pavement, no way. But when it's in its element, far off the beaten path, it's amazing. Fiat-Chrysler Automobiles (FCA) just released its business plan update and confirmed the rumors about which we’ve been speculating. 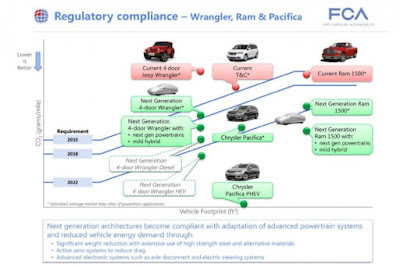 The diagram above shows Fiat-Chrysler's Jeep, pickup, and minivan plans. The buying public's ever-increasing purchases of larger crossovers, SUVs, and trucks are coming at the expense of more fuel-efficient cars. 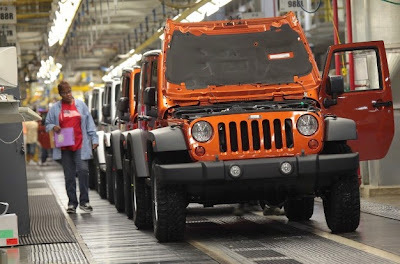 To meet Corporate Average Fuel Economy requirements, Fiat-Chrysler plans to add diesel, mild-hybrid, and full-hybrid powertrains to the new Wrangler in addition to the standard gasoline engine. Undoubtedly, the alternative powertrains will add cost and complexity due to the additional electronics, batteries, and diesel aftertreatment hardware, but each powertrain will expand the vehicle's appeal and offset the fuel economy and emissions penalties garnered by the bulk sales of the standard gas model. 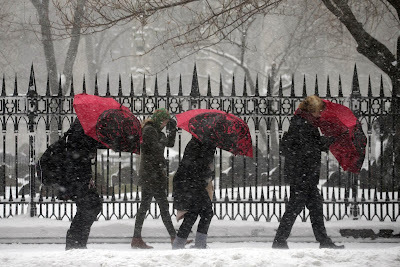 While most people complain every winter about the annual snowstorms, and the sensationalist news media fills up air time by inflating run-of-the-mill snowstorms into horrific once-in-a-lifetime Snowpocalypse events, there are others who realize a little snow is a good thing. Jeep owners, especially. It seems that most people enjoy watching his harmless recreation while the city is "shut down" but as always, a few do-gooders have to call the cops to complain. Watch to the end of the video to see the NYPD's coolest officer pull them over to say "Someone complained about you so we're just gonna act like we're talking to you . . ."
There are numerous benefits to airing down your tires when driving off-road. As I've written about before, the obvious improvements that every 4wheeler knows are ride quality and traction. 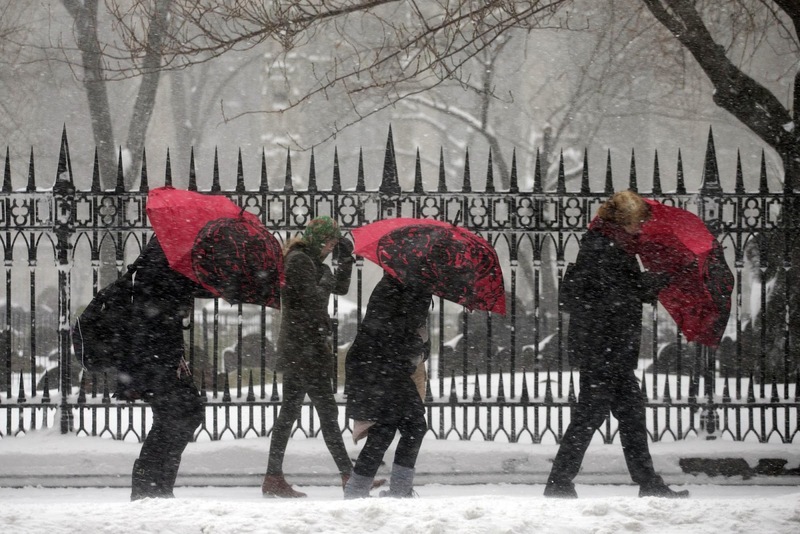 What fewer people realize is that tires are more resistant to punctures at lower pressures. 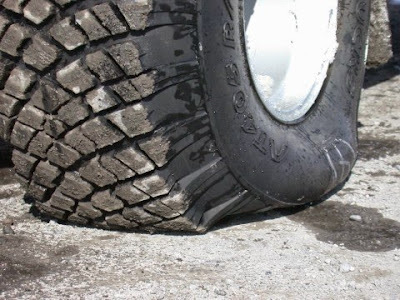 Obviously, a tire with heavy-duty construction will be more puncture resistant than a light-duty tire, but owners of all pneumatic tires benefit from proper inflation pressures. 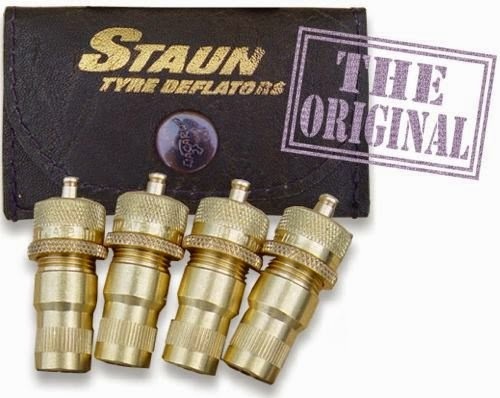 I continue to be impressed with the ease (and more importantly, the accuracy) of the Staun Tyre Deflators I use. I find that I'm much more likely to air down when it's so quick and convenient to use these deflators. They have never failed to shut off at their exact pre-set pressure. Just don't forget to air up again before hitting the highway! 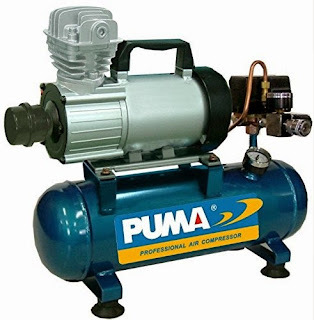 There are countless compressors that are available for the offroader, from the inexpensive but decent MV-50 to converted York engine-driven compressors, but the best combination of cost, power, and simplicity is the Puma Compressor. 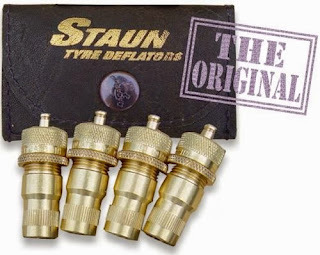 I've been using this for nearly a decade, and its combination of a fast compressor and a 1.5-gallon pressure tank allows me to very quickly inflate all four 35" tires (plus my two trailer tires!) faster than anyone else in my 4wheeling group can typically inflate two. Additionally, the blast of air that's provided by the pressure tank is sufficient to reseat a blow bead. There will be a large portion of that vehicle that will be aluminum. It will not be all aluminum. We've run the numbers and we've simulated mileage and the impact. Because of the difference in cost -- not just of the material but the actual assembly process -- I think we can do almost as well without doing it all-aluminum. I think we can get very close. 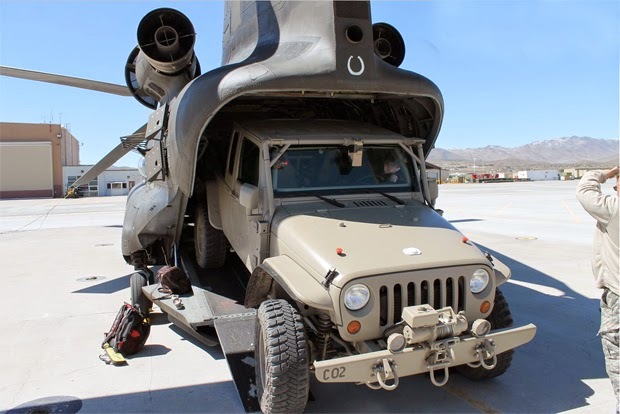 This likely means a steel ladder frame and body tub, while the fenders, hood, doors, tailgate, roll cage, windshield frame, and other add-on body parts will be made from aluminum. Reading between the lines, Marchionne is stating that this combination of alloys will provide the best cost/benefit ratio, as the Wrangler is a low- to midrange vehicle that is both in dire need of improved fuel economy and the retention of its benchmark-setting offroad performance. 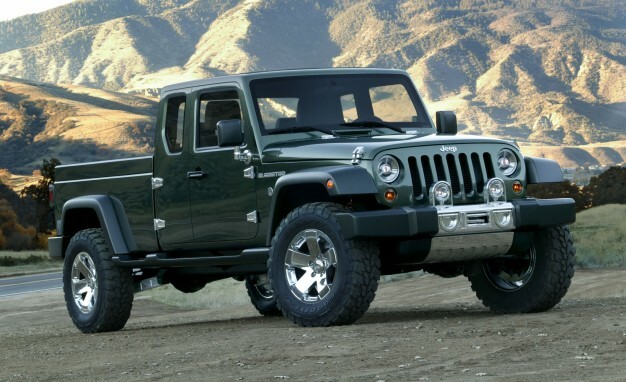 The definitive Jeep must meet certain government-mandated requirements without compromising its appeal to the core enthusiast market, or else the "Wrangler magic" will be lost and the vehicle's reputation and desirability will suffer tremendously. Much to the relief of patriotic Jeep brand fans and the people of the Toledo Assembly Plant, this will also likely mean that Toledo, Ohio will continue to be the home of the Wrangler. 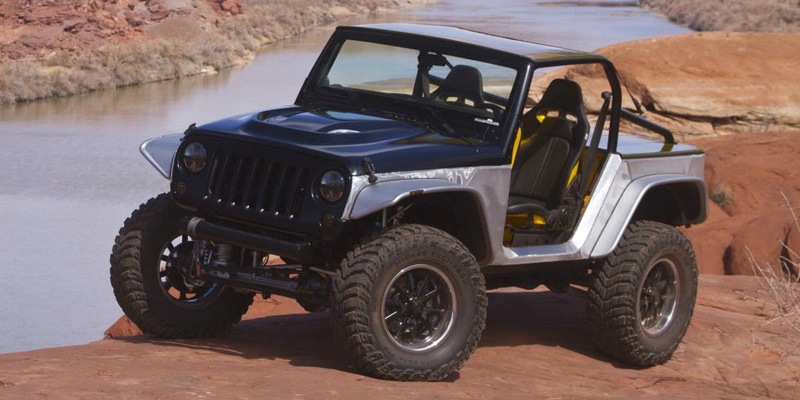 Jeep has been hinting at a "lightweighting" of the Wrangler for years, most conspicuously with the 2013 concept Wrangler Stitch that they exhibited at the Moab Easter Jeep Safari. This was a follow-up and expansion to the 2011 concept Wrangler Pork Chop that was exhibited two years prior at the Jeep Safari. 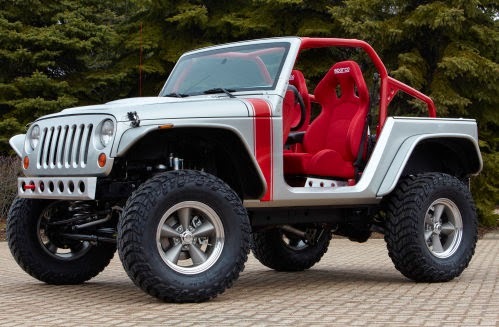 These concepts prove that a lightweight Wrangler can certainly still meet the performance benchmarks of a proper Wrangler. The test is more difficult than either the head-on crashes conducted by the government or the longstanding IIHS moderate overlap test. That's because, in a small overlap test, the main structures of the vehicle's front-end crush zone are bypassed, making it hard for the vehicle to manage crash energy. The occupant compartment can collapse as a result. 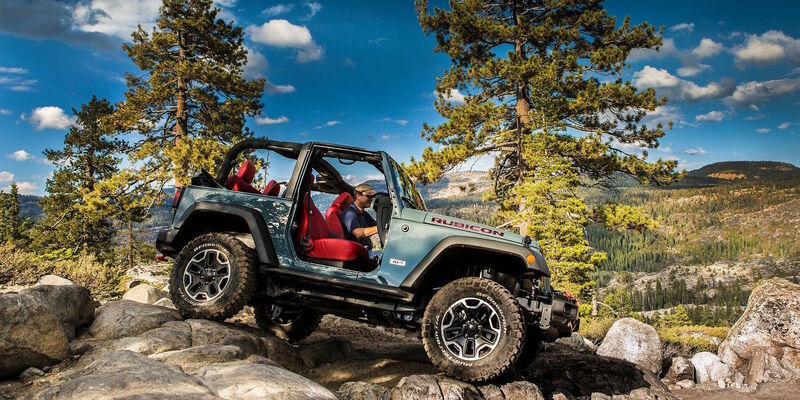 The strength of the Wrangler's chassis plays a key role in its ability to limit structure deformation and intrusion into the occupant area. 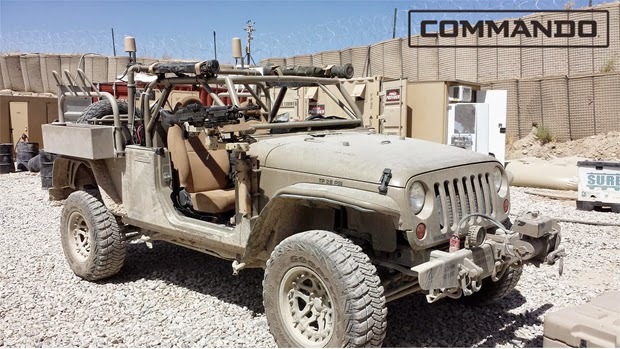 The wide, overbuilt frame rails deflect the Jeep away from the object and slows the rate at which energy is dissipated, which in turn lessens the impact on the occupants and lessens the severity of the vehicle's deformation. The Wrangler performs better than most vehicles in spite of its lack of side-curtain airbags. A parade won't draw this many people from every corner of our country, however. The rest of the event included mingling with other Jeep owners, meeting representatives from dozens upon dozens of Jeep aftermarket parts companies, and driving on man-made obstacles inside the Daytona International Speedway. 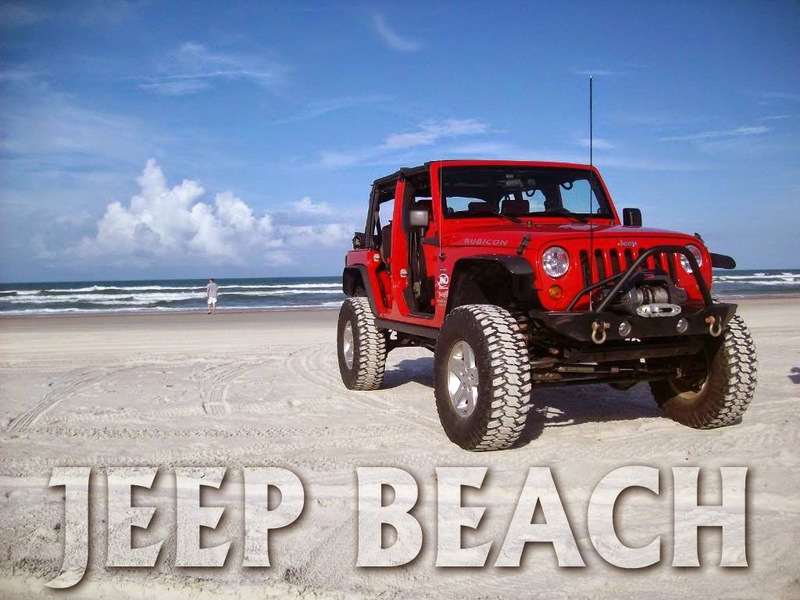 Jeep Beach is a lot different than the typical Jamboree-, Trek-, or Safari-style offroading event we're used to out West, but the Mid Florida Jeep Club has developed this unique and fun event to rival any others in popularity. Even 4wheelers who never attend Jeep Beach benefit from this event, as the Club makes huge donations to the BlueRibbon Coalition for use in the fight to keep public lands open to the public.